If you know anything about serious bug hunters, they're nuts about hunting and notice I said bugs not lobsters, cuz that's what we tend to call them. It is a wild sport and about the most challenging sport you can do in the water. A good bug hunter must be tough, quick and smart. If you are careless, you get to take home urchin spines in your hand as a souvenir. Unless you are pretty good, that's likely to be all you get to bring home. I've been lucky enough to know a lot of bug hunters, but it isn't all luck. I have gone to the same places for the same reason. 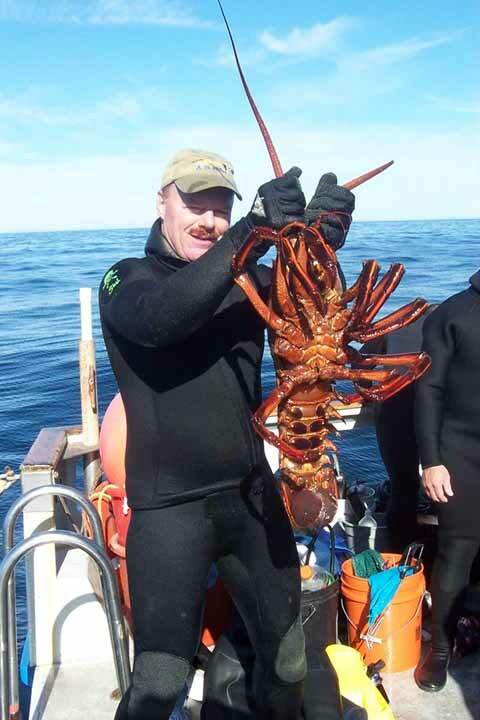 There are only a handful of divers that I have known that I consider master lobster divers. They have not only the required knowledge, water skills and stamina to be good hunters, but also the devotion and perseverience it takes to be great hunters. These are the guys that year after year go out during the whole season, under all conditions, to do what they love doing best. Of all the hunters though, I think Shel is the best of them and I don't think I'll get a lot of disagreement. There is nothing he likes to do better. He is a hunter and he is going to go hunt. Then, when Shel gets a big one, he lets it go because they are the best breeders. 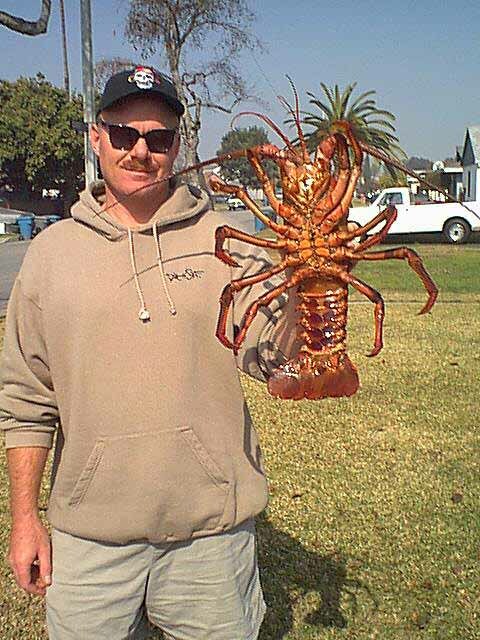 If he doesn't get the biggest one that day, he'll try to trade some of his lobsters for the big one so that he can let it go. 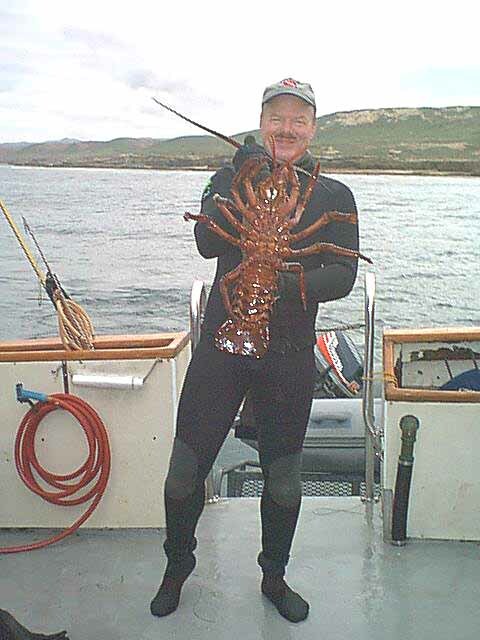 He has also has convinced some of the other good hunters to release their big lobsters. They do it because he shows such excellent style. If I sound like a fan of his, it's because I am, but then I love bug hunting and I respect the guy that can show us all how to do it. In any case, in a few places I've written a bit about what I know of his adventures, as they must be called. Occasionally, when he has a good trip, he sends a note to his friends to give them something to think about. I put together a few of his notes here and I think they make fun reading. I think that first, I'll put a paragraph that he told me while we were on a trip to San Nicolas. This is part of a longer essay, but I think it tells something about what it takes to be as devoted a hunter as Shel... Besides, he's no where near as wordy as me. I had swam through the Boilers and was coming back around the right side at 57 feet when I saw this nice bug in a hole back in the rocks. My pressure gauge was already pegged, but I wasn't having trouble getting air, so... The bug was back out of reach but I thought 'well, I could move this rock and I could move this rock and then I could move this rock and there I am'. The main thing was not to get excited and start breathing hard. I took off my tank and put my bag in my other hand. It already held two bugs. I then dove in the hole and was able to get a good grip on the bug. I got out quick and headed for the surface with my tank hanging from my mouth by the regulator. Three kicks and I was up to about 30 feet. Since my hands were full, I used my fin to turn my gauges over so I could watch my ascent rate. Once on the surface, I shoved the bug under my arm and got hold of my tank. Then I could turn on my side and spit out my regulator so that I could get some air. It was a nice 5 pounder. Gone down lately? Then go diving!